Let’s face it – this is a slow news week with Thanksgiving approaching here in the US. Though there isn’t much news, it’s a huge week for traveling. 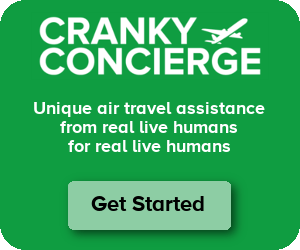 I know I promised to write about what’s happening with Cranky Concierge, and I thought this was a good time for it. We’ve now had more than 40 clients traveling on nearly 200 flights. The outliers are always fun to talk about (and you can follow on the Cranky Concierge Facebook page), but today I thought I’d show you the benefits of using Cranky Concierge even when everything goes right. Let’s take a recent example from this week. We had a client who signed up about a month ago in need of assistance getting from LA to Orlando for Thanksgiving. There was a catch. While she wanted to fly American, she also wanted to get enough miles to requalify for Gold status for 2010 and a Dallas connection wasn’t going to cut it. In the end, she chose flights that went through Chicago on the way out and came back from Tampa through Miami. That way she just squeaked across the line for requalification. I hope you’re ready for your trip. So far so good as the flights look to be on time. Your airplane is coming from Chicago as flight 607. It is in the air and will be arriving LAX at 1112p, ready for a good night’s sleep before taking you back to Chicago. The weather looks great in both places so that shouldn’t be an issue. It’s too early to figure out where your airplane is coming from, but I will have a full update on your flight status when you arrive at O’Hare. If you would like any information on wireless internet, restaurants, or shops at any of the airports through which you’ll be traveling today, just let us know. If you send an urgent request, we will make sure to respond within 10 minutes of receipt of the request. Other non-urgent requests may take longer to respond. Thank you for using Cranky Concierge. If you have any questions during your trip, email us as assist@crankyconcierge.com or call/SMS at (707) 797-7474. Early the next morning I received an email from her that her gate had changed. Sure enough, the Chicago gates had changed as well so I gave her those updates and promised to have more when she arrived in Chicago. When she was in the air to Chicago, I noticed that she was expected to land early, and that she might be able to run to an earlier flight to Orlando that appeared to have good availability. I sent her a text message saying that if she didn’t have bags, she should run directly to that gate so she could try to get on. Unfortunately, she had checked a bag, so she had to hang around O’Hare until her scheduled flight. I figured she would be hungry, so I suggested the Prairie Bar or, of course, Garrett Popcorn for a tasty treat. I also explained that the airplane for her flight to Orlando was on its way from Newark and would arrive with plenty of time for her flight to be on time. She reported back that Prairie Bar wasn’t that great – that info is now going into our database for future clients. She headed to her gate for an on-time departure. Before she landed in Orlando, I sent her a message that her bag would be at carousel 4. I’ll do this all again when she comes back next week. So while she wasn’t stranded (and hopefully won’t be on the return), she still received a good deal of value from Cranky Concierge. Keep that in mind on your next trip. We’re always happy to help. Since today it the 38th anniversary of him, a parachute, and $200,000 jumped out of that Northwest 727 over Washington State. While NW will soon be gone, that mystery will go on. Slow news? What about US Airways deferred delivery of 54 Airbus aircraft? Nope, not actually in Northern California – I just picked that phone number via Google Voice because, well, it’s 707! Yeah, well I wrote this piece last night so I didn’t see that coming. But that’s not really something I’d write about on Cranky anyway since it’s mostly just a financial transaction. Sure, they will keep flying older planes for longer but that’s the only real impact on customers. Its been wonderful to see how the service has evolved, since the days of my early testing. It looks like there have been some wonderful improvements. There’s a new restaurant that just opened in the … C gate area (I believe), but at an intersection of another side hallway heading off to the little arm where the Ted gates *used* to be… I know that’s not very helpful, but I can’t remember the gate designations over there. Anyway, the restaurant is off the beaten path, so you would NOT know it’s there unless you happened to go down toward those ex-Ted gates. But, the menu & food looked delicious — it is some kind of Italian terrace-y thing — and there is NOTHING else in that whole long B-C gate hallway except McDonald’s and Starbucks so trust me, this is a great thing to know about. Just discovered this website. That’s some concierge service! I guess you do get what you pay for. Too bad about the Prairie Bar at O’Hare. At least you can updated your records. Good catch, Myriam. It looks like it’s called Tuscany and it is in the “banana” down where the old Ted gates were – B19-B22. From the reviews on Yelp, the food seems to be stellar. Thanks for the heads up! While I have never eaten at Tuscany at the ORD outlet its just an average Italian restaurant in Chicago’s Little Italy. They used to have a mediocre outlet across from Wrigley Field but that closed in the last year or so and is now a bar … just what that area needs.